Making money online is easy if you know the right way of doing it often new people find it difficult to make money online because most of the time they don’t realize the bigger picture behind it and give up right at the moment when they should have kept it going. Online business is like any other brick and mortar business where you need to look after it, work on it till it grows big and you can reap fruits at the end, Today I am going to share a basic affiliate marketing plan beside you. I am not revealing some advance strategy like email marketing and some other hot techniques if you want to learn them too you can go with Affilorama Affiliate Training Program and learn step by step training over there. If you stick with this plan you will start making few hundred dollar each month(Stop thinking about becoming Bill Gates at this moment) but you have to promise to yourself that you will not think about money in the first 3-4 months of your beginning. Trust Me This is really important! Most people just keep checking their account if they had made any sort of sales and when they see 0$ in there account it really brings their confidence down the reason I am telling you these because this had happened with me when I was starting out. So I made a habit of not checking my account every day. The first thing you will require is a website sorry! But affiliate marketing does require a website you can get it through companies like Hostgator and a domain name which going to be the name of your business. You can set any catchy name but it should be related to the product you going to promote you can’t just put “dog” in your domain name if you are selling “cat” products just think logically. Ok, I hope that you have cleared this part now you have to install wordpress don’t worry hostgator has one click install option you just have to fill few forms choose userid and password and your new blog going to ready within few minutes. Tip: So choose those which are at “6-20” gravity rang. Now here is the master plan how to create content? , In affiliate marketing you can’t just write anything and people will start buying no it’s not like that you have craft content in such a way that it boost sales. Now let’s take an example if someone has “Hair loss problem” what he or she will search on Google. “How to prevent hair loss” now as you can see he is has a problem and if you have a solution for that problem you can make a sale, Now what you should do is write an article on “how to prevent hair loss” and on that article recommend some products that will help them solve their problem and bang “you got a sale”. So articles that provide solution and tutorial kind of articles generate sales and here is my bonus idea! which i am giving out for free. Try writing few product reviews. Basically a product reviews are considered as highest converting articles as people are already in the state of buying but they are looking for final opinion before they make checkout so these articles makes maximum sales i don’t know about others but here at my blog i usually get around 3% conversion on my reviews. In Step 3 everything seems to be so easy just think of a problem and provide solution and you can start making money isn’t it no it’s not that easy as it looks now there are other affiliates out there just like you. And you have to fight for your space. Taking the previous example if you search “how to prevent hair loss” you will come up with lots of search results the website listed on that search results are your competitors you have take them down and get your article up in that first page because the problem is most of the visitors browse after 1st page of Google search result. So if you are at the first you have a chance to make sales. So all your work as an affiliate is to get your article at the first page of Google. First you need to target those keywords which are not highly searched but still have decent searches per month like something between 5,000-10,000 searches/month At first avoid going after those keywords which have more then 20,000+ searches because these are targeted by powerful affiliates which are in this business from several years and there website have now become established online brands and it not going to be easy to take down those bigger dogs right now. So leave them at the moment.You focus should be on low hanging fruits right now. 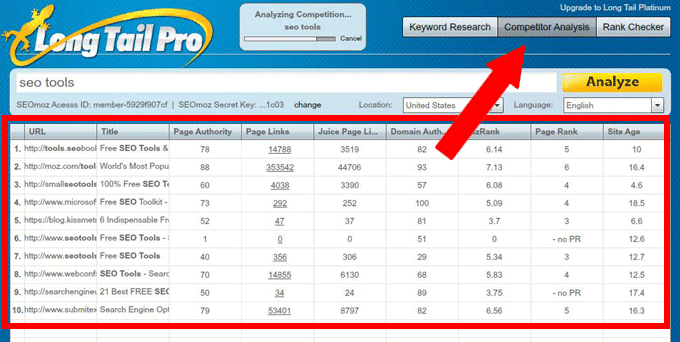 To find those least competitive keywords we are going to use a tool Long Tail Pro using it you can find the competitiveness for any keywords so it gives out a clear idea about whether it’s worth to go after contain keyword or not. After finding the right keyword you just have start building few links on your targeted articles which you want them to rank. links are like votes in eyes of Google the more quality links you have the higher position you get in the search results. So you have written and article and successful ranked them up on the Google now don’t wait all you have to do is to rinse and repeat for the other products too start creating couple of more contents keep ranking them up to increase the chances of getting sales soon you will see your affiliate income grow each passing month. IDplr.com Review: Don't Be A Stupid! !